Menemsha Market owner Debbie Packer thanked the town and emergency responders following recent fire at the village market. A proposal to establish a new collaborative Island health group began circulating in Island towns this week. Cynthia Mitchell told the Chilmark selectmen that the Island Integrated Public Health Collaborative would be the first integrated Island health organization to collect and analyze public health data on the Island. The idea of the new venture is to prioritize community health needs and develop an assessment to qualify for federal grants, she said. Mrs. Mitchell is the chief executive officer of Island Health Care, a federally funded community health clinic in Edgartown. 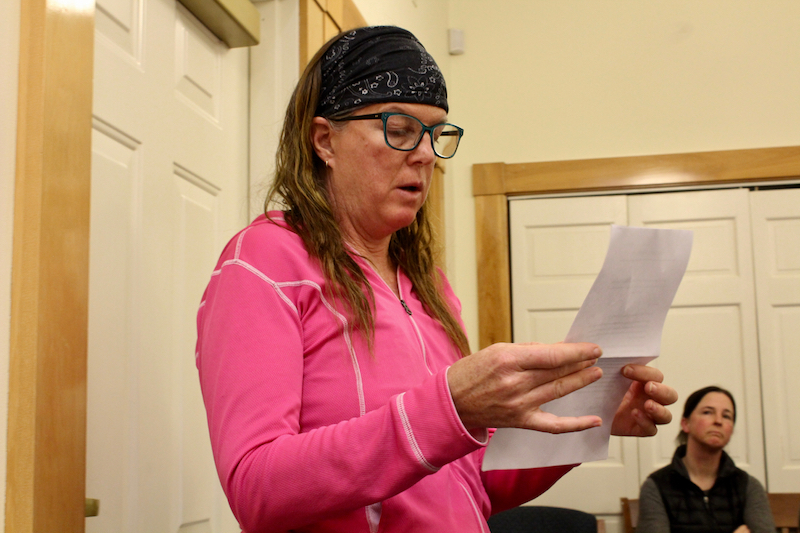 Appearing with county manager Martina Thornton, she presented her draft proposal to the selectmen at their meeting Tuesday night. Among other things, they said the new group proposes to perform ongoing, comprehensive health surveys and establish an office on the second floor of the Center for Living in Vineyard Haven. Grants from Island Health Care would help provide funding for the new group, which has also applied for a Martha’s Vineyard Vision Fellowship. Ms. Thornton said approval from all six towns is required in order for the group to lease the second-floor office space of the Center for Living building at no charge. Island towns contributed to the purchase of the building two years ago. Ms. Thornton said the county has unsuccessfully sought tenants for the second floor space. “This fall, Cynthia contacted me with a proposal . . . which would put the space in my opinion to good use for public benefit,” the county manager said. Selectmen unanimously agreed to the change. “Go forth and prosper,” said board chairman Jim Malkin. In other business, selectmen agreed to seek assistance from the Martha’s Vineyard Commission to help design a new parking arrangement for Menemsha this summer. A plan to build a bus turnaround north of the has been put on hold for now. “It is the struggle to keep things the way they were but accommodate many more visitors. It’s that balance that we’re struggling with,” selectman Warren Doty said. Selectmen also settled on a fee structure for large commercial events in Chilmark Community Center, including the Martha’s Vineyard Film Festival. New fees will be phased in over the next three years. For this year the fees are set at $600 a day with an additional $200 for additional days needed for set-up. Fees will go up each year and will be capped at $1,000 a day in 2022. Selectmen also discussed creating a governance group of Island town administrators to oversee the county sheriff’s department as a prerequisite for the department receiving town funding for maintaining a new 911 communication system. Sheriff Robert Ogden secured state grant money to pay for the $4.6 million system, but is asking Island towns to share operating and maintenance costs that could reach $338,000 annually. Chilmark police chief Jonathan Klaren told selectmen Tuesday that he supports the 911 upgrades, but he questioned the accuracy of claims that the current communications infrastructure is in crisis. “I don’t have any concerns that if anyone needed 911 today, tomorrow, or next year that it would fail,” the chief said. Menemsha Market owner Debbie Packer held back tears as she reported on the severe structural damage to the 95-year-old village store from a recent fire. The market will stay closed this summer. She also thanked emergency responders and gave a tribute to Conrad Neumann, the Chilmark oceanographer and poet who died last week. “Our dearest Conrad Neumann was part of the fabric that makes the porch of Menemsha Market a special place,” she said. Selectmen offered encouragement and thanked Ms. Packer for her contributions to the Menemsha community. “You have been a wonderful steward for that facility,” said Mr. Malkin. “I wish you the best of luck in your rebuilding,” added Mr. Rossi.